Recently I’ve been stalking the blog of Michael Hyatt. He is a well-known blogger entrepreneur that focuses in intentional leadership. I stumble upon his blogpost on creating an ideal week. That post truly motivated me to create mine. So here’s screen shot of what my ideal week is. 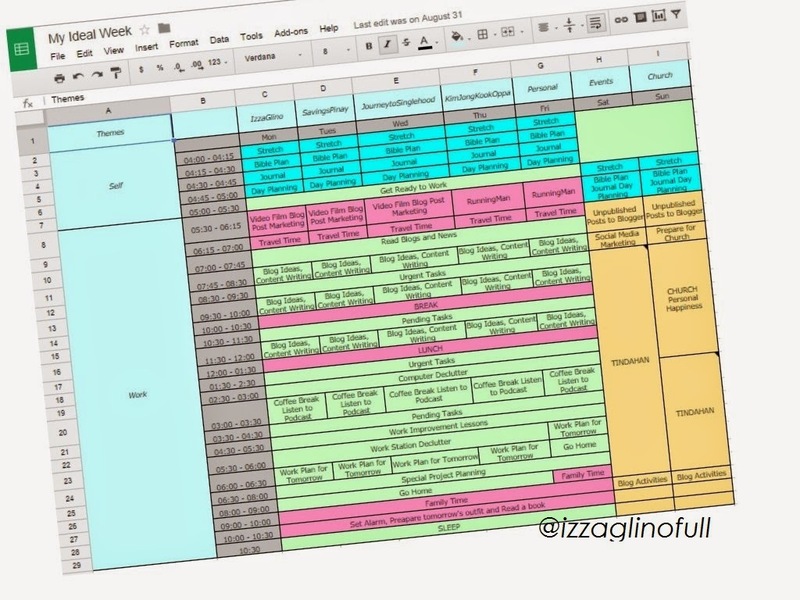 This is purely based on Sir Michael’s Ideal Week template. So to explain I’ve got three main columns in my template. The first column is for my main theme. I’ve written self and work as the main theme categories of my daily life. Notice how Self is in the morning or the earliest time of my day. This is setting a priority of hierarchy towards my intentions. My Saturday is reserved for Events which is my hosting gigs. If I don’t have a gig on a particular date, I then do exactly on what’s written on my ideal week that you see which in this case is going to our store (family business) to help. I also do all of the facebook marketing, video editing and blog posting (I schedule all contents I created during the weekdays) on this day. When you have a template on what your day is, it is very natural for you to live by that standard. Before I created this ideal week I procrastinate at work and really devote all of my time and energy to time-wasters. I feel so unproductive that I don’t finish anything that I started. But with this ideal week I realized that I can balance my life, my work and my hobby if only I give my 100% attention one item at a time. I learned the value of morning routines and how to wait productively. This is a primary tool to be a master of time and to live by your purpose.